I took the day off of work yesterday. My weekends for the remainder of the month of December are completely packed and I wanted a day to leisurely “finish” (still more to do, but the intent was there) my shopping and my holiday cards (I’m making my own this year). I didn’t want the frantic anxiety of the December 23rd rushed trip to the mall and I wanted to ENJOY this time. One of my colleagues mentioned that she takes two days off in December to do just that and I thought it was a brilliant idea. I decided to start the day at Target. If I previously thought a trip to Target couldn’t get any better, I was wrong. It can: Arrive when it opens. I pulled into the parking lot at 7:58. I was surprised to see there were already lots of people sitting in their cars waiting for the doors to open, too. My fantasy of a completely empty store was dashed (don’t you people have jobs to go to? 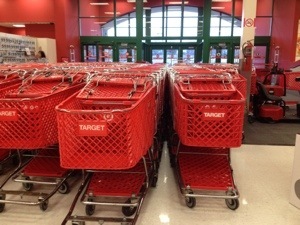 oh…wait…), but it was still heaven when I walked in and saw rows and rows and ROWS of carts. I’ve never seen that. What a sight! I felt like I was behind the scenes on a movie set. After a few moments I realized I needed to stop reveling and move on so I snatched the nearest cart and breathed a happy sigh. I spent a glorious 2+ hours roaming the aisles throwing gifts, clothes, decorations and holiday cheer into my cart. Talk about comfort and joy.